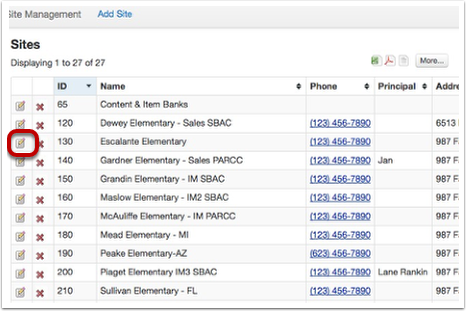 This lesson will guide you through the steps needed to update all of the school specific site management data so that the CRDC tool will pull all the appropriate data for submission to the Office of Civil Rights. Please note that you can submit the whole file at one time, or submit pieces of the file one at a time, just make sure that the whole file has been submitted by 75 days after the opening of your submission window. You will not be able to login for submission until the date the window opens for your region. 2. From the list of sites provided, choose to edit icon the site you are working on. It does not matter what order you edit the sites in, just as long as all necessary sites are edited. Once you are in the edit site page, scroll down to the section entitled Civil Rights Data Collection (CRDC) Fields. NCES ID number for each site will auto populate from this field only to all necessary places in the CRDC extracts. The NCES ID number is NOT the state provided LEA number. NCES numbers can be located at National Center for Education Statistics (https://nces.ed.gov/ccd/schoolsearch/). Is this school site a fully Special Education School? Select Yes or No. Does the school site operate a magnet program, or is the school a magnet school? Select Yes or No. If the school site is a magnet, does the entire school participate? Select Yes or No. Is this school site a Charter School? Select Yes or No. Is this school site considered an Alternative School? Select Yes or No. If this site is an Alternative School, does the school focus solely on academics, discipline, or both academics and discipline? Select the option from the dropdown. Remember to Save this screen before navigating to back to the Site Management home page. Please remember you will need to update these fields in all reported sites manually. Repeat the above steps for all reported sites. Now that your reported sites have the appropriate details assigned, you are ready to begin using the tool!